Mother Nature has a great way of guiding those who wish to explore her land or ply her vast seas. She places unusual geological features for us to use as landmarks. Nature’s way has become so effective that even with today’s GPS and digital-map technology, people still rely on sighting natural landmarks to navigate their way around. 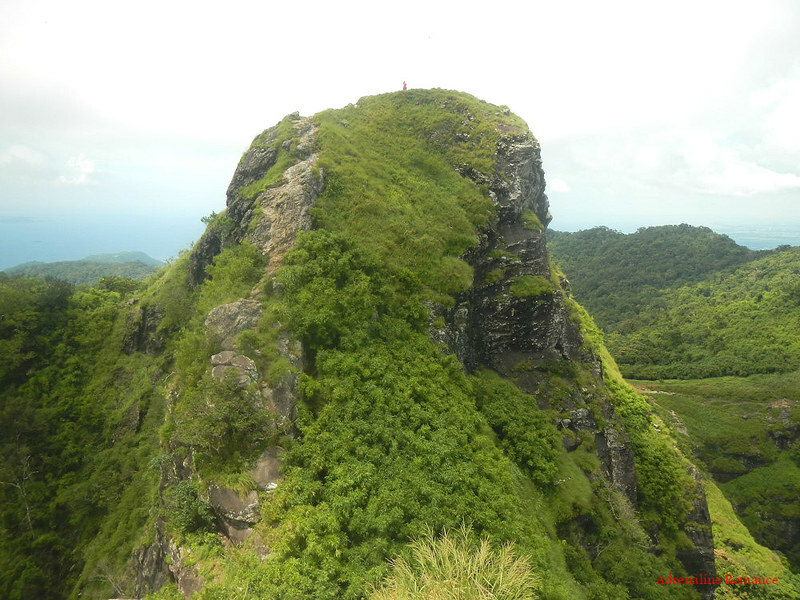 Our last stop in our Batangas-Cavite sojourn was Pico de Loro, one of the most unusual and beautiful landmarks in the province of Cavite in the northern island of the Philippines. 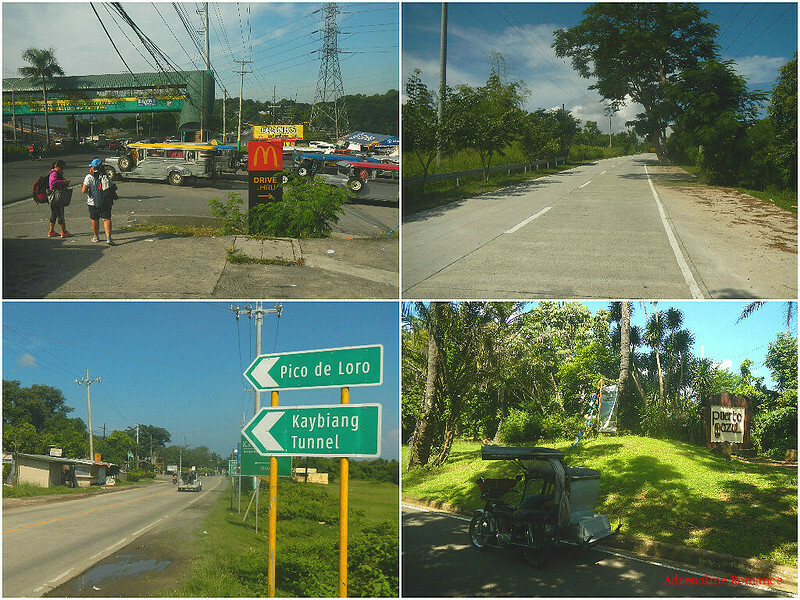 After a long series of rides that took a large chunk of our morning, we finally arrived at Naic, Cavite where we were able to get a tricycle that will take us to Pico de Loro’s DENR station. 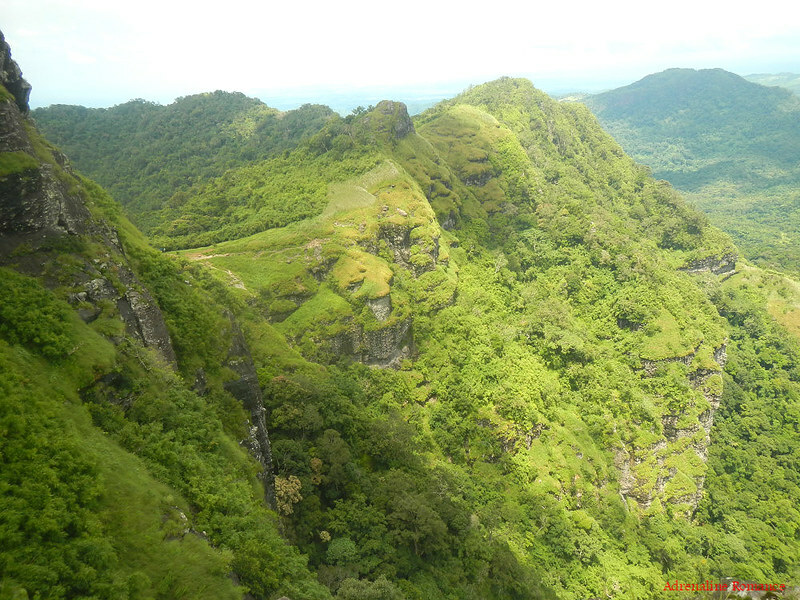 Going there involved a 45-minute uphill ride in which the tricycle strained and groaned under the weight of five people! In fact, we had to disembark a few times to prevent the screaming engine from overheating. Complicating the steep and long ascent is this hill’s strong magnetic energy. Yes, we meant that literally. 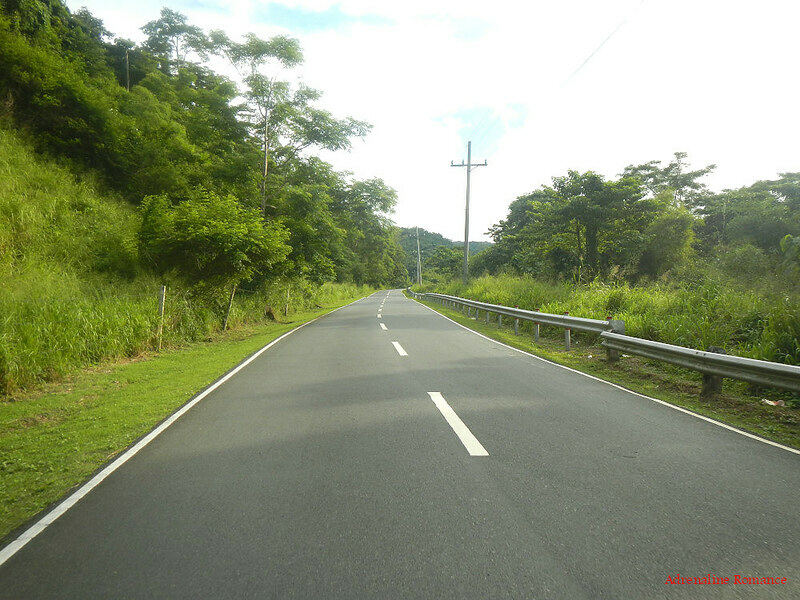 Magnetic Hill in Ternate is along the way to the DENR station. According to locals, the metals in the hill produce a strong magnetic field that further strains the engine. 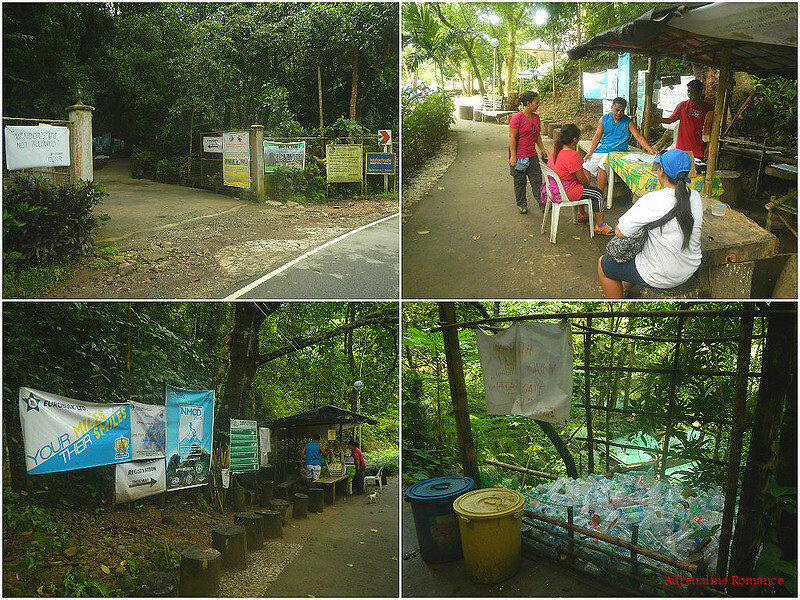 Finally, we reached the DENR station, our jump-off point for the climb. After a short briefing and paying the registration fee, we left things that we don’t need for the climb at the station. 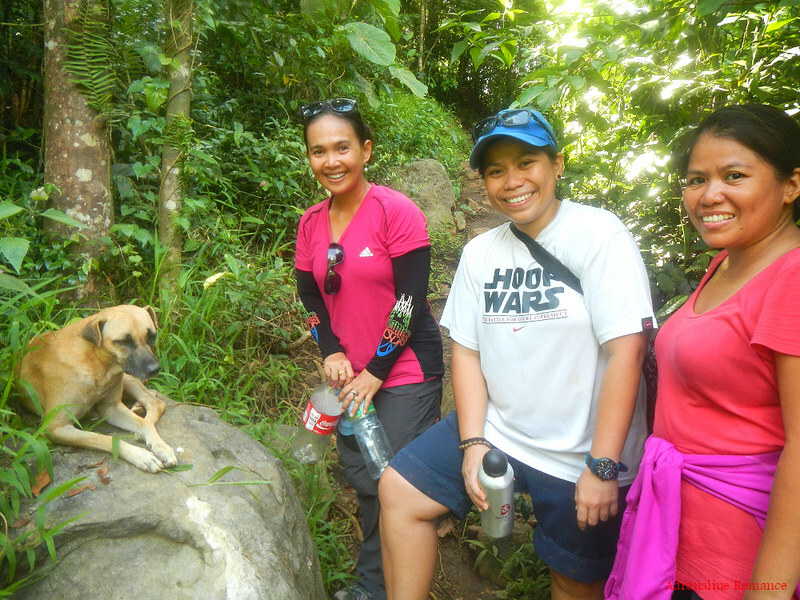 We were also happy to know that DENR officials regularly climb the mountain to pick up trash left behind by careless hikers and locals. They also teach locals on responsible trash segregation and disposal. Since the place is right beside a cool, flowing river, it is apparent that many people would come here to refresh themselves. 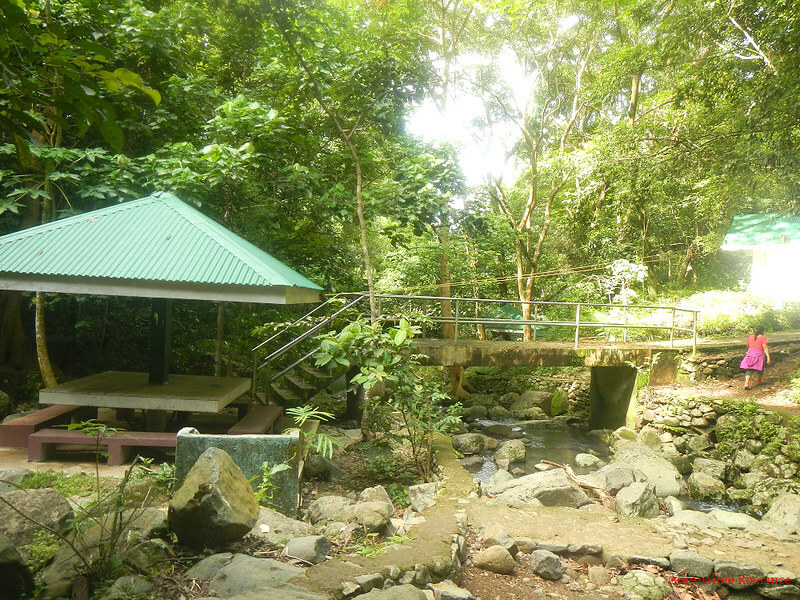 Thus, DENR constructed some concrete sheds that act as picnic areas for people who want to wade and bathe in the river’s elixer. At the end of the concrete starter path came the real trail, which is right beside the rocky river. 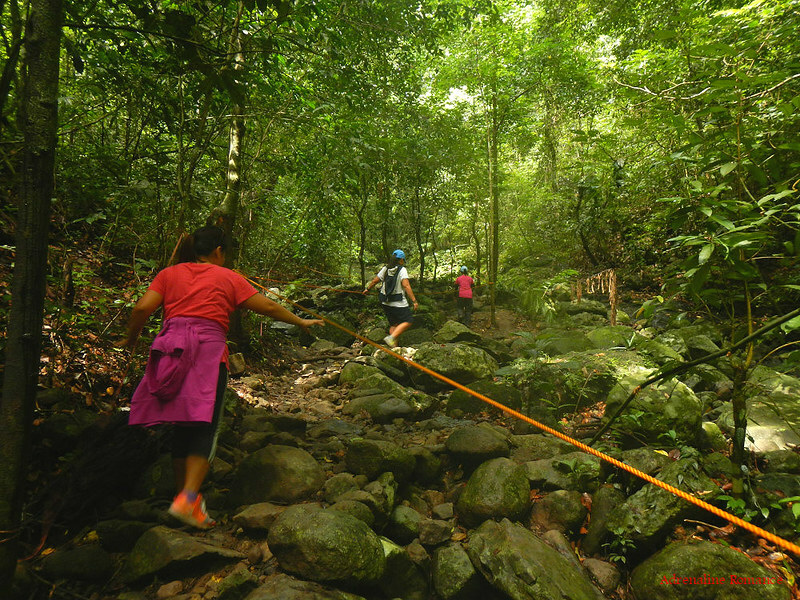 A length of rope guides trekkers along the right trail; it’s not a rated safety rope. Now, that’s a beautiful river. 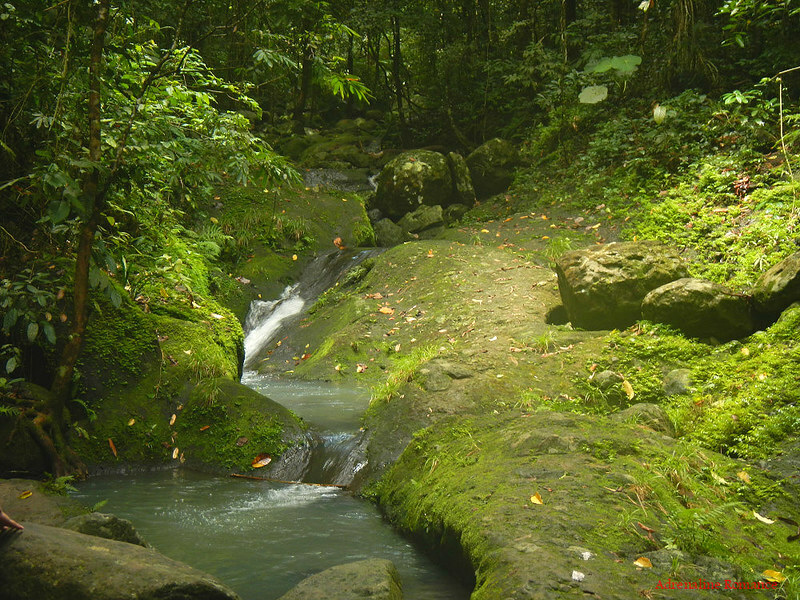 It is fed by both rainwater and an underground mountain spring many kilometers deep into the jungle. That cool, clean mountain water totally refreshes you on a hot day. In fact, we spent a few minutes enjoying the feel of cold water running between our fingers. We need to preserve pristine and healthy river systems like these because they supply the lowlands with fresh, potable water. Furthermore, they are crucial conduits that give life to rich ecosystems. Quarrying, pollution, and deforestation negatively and heavily affect these precious rivers. After half an hour on the trail, we left the river behind and went deeper into the woods. Moss-covered ditherocarp trees like those of Mt. Kanlaon’s forest cover are everywhere! Yes, it’s a healthy forest, but we’re not sure if this is second or first generation. There is a sign in the DENR station that there was a reforestation project in the area. If this is it, then we commend the DENR for the success of the project. Most parts of the trail are muddy, soaked by evening rains or morning dew. The water can’t easily evaporate due to the thick forest canopy. In some places, massive roots of old trees stick out of the ground. 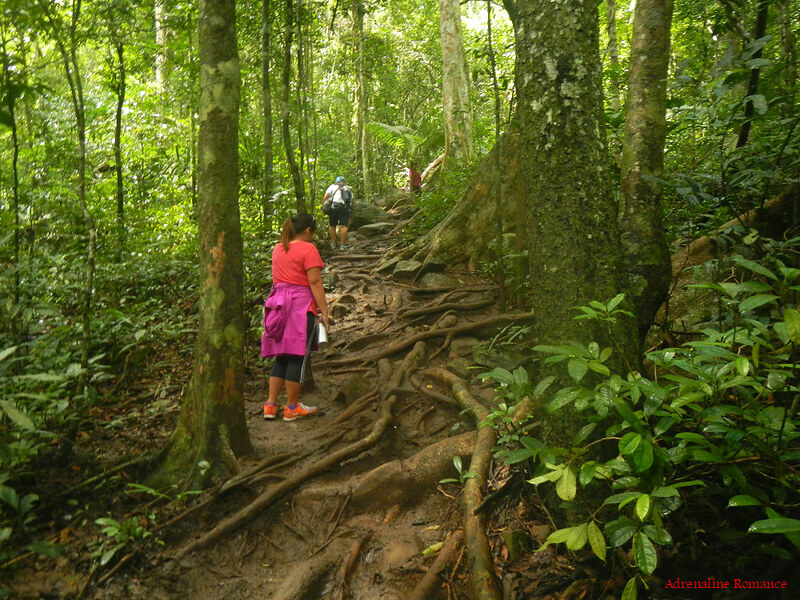 Hikers need to watch their steps to avoid snagging on one of those roots. 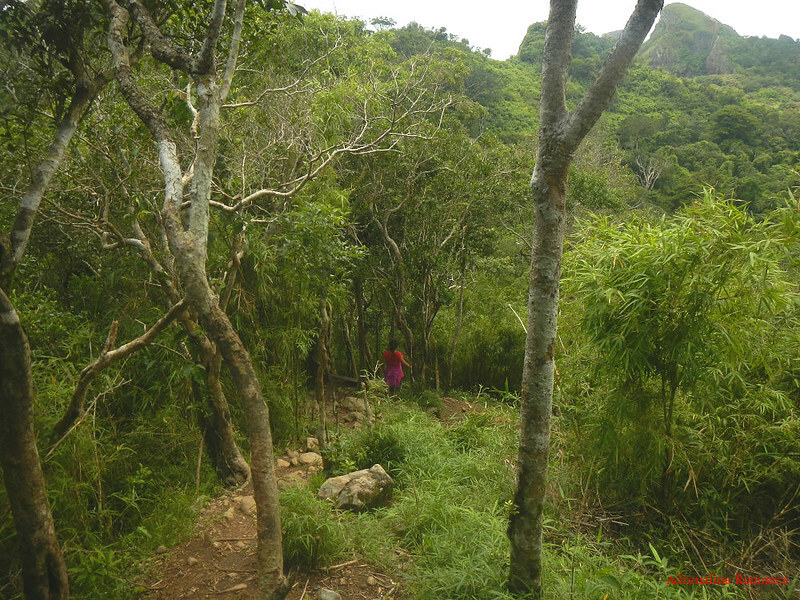 This dense forest is part of the Mounts Palay-Palay and Mataas na Gulod Protected Landscape, which covers a little over 3,973 hectares. It was officially established as a game refuge, bird sanctuary and national park in 1976. 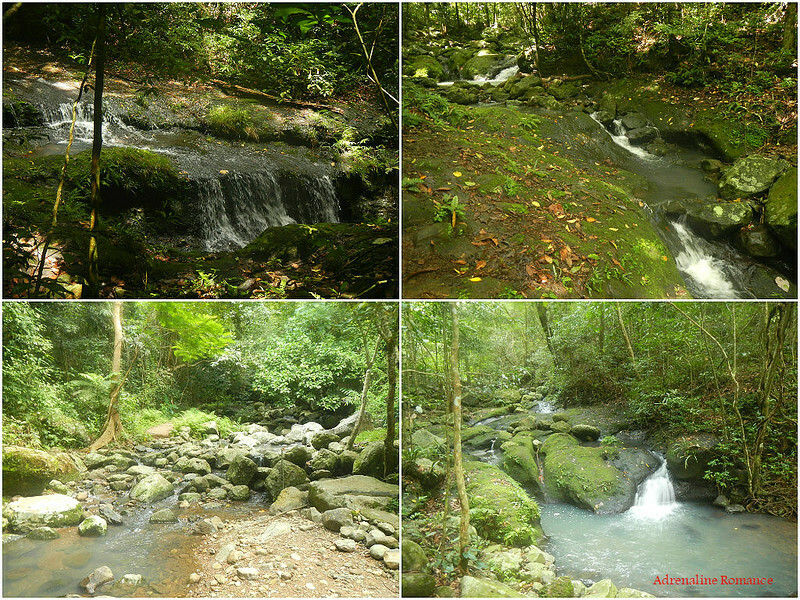 Today, under the National Integrated Protected Areas System through Proclamation No. 1315, the park is now a protected landscape. 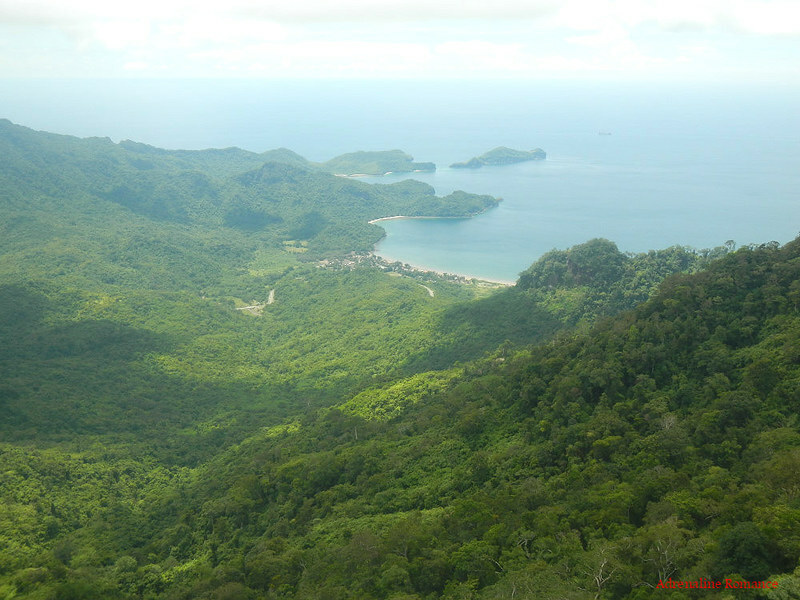 It is the last remaining original lowland forest in the Cavite province. You are actually looking at a giant wall of soft mud in the photo below. The best thing about it? It’s part of the trail! We had to scramble up using roots, vines, and depressions to make progress on our ascent. Further along the trail, moss-covered rocks gave way to mud and roots. They require extra care to tread as they are quite slippery. The forest is one big world of green and brown. 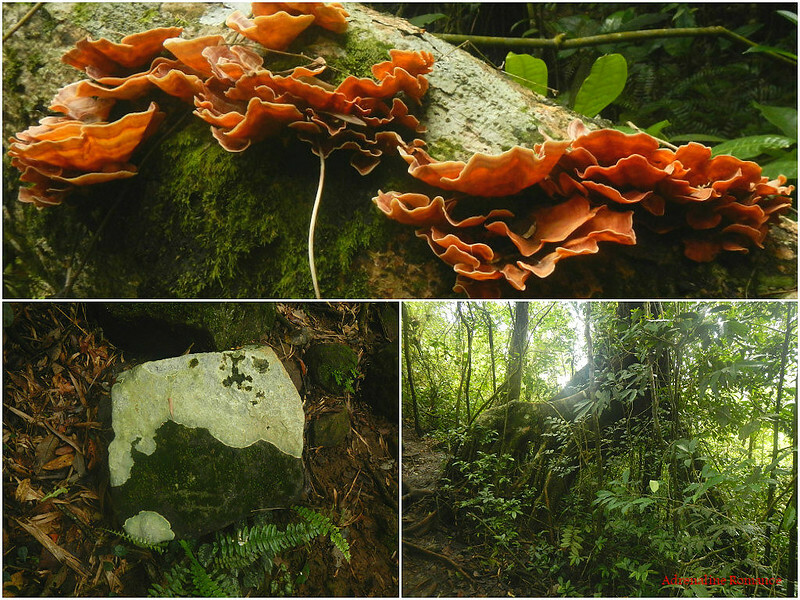 However, if you take time and effort to take a closer look, it can be chock-full of unusual sights such as this large patch of bright orange fungi which breaks the monotony of the color green. We also found a large stone that is half covered in moss, a complete mystery since the demarcation is quite sharp. Considering the heavy moisture that permeates in the forest, this stone should be covered wholly in moss. Of course, there are trees whose unusual root arrangements form tunnels and caverns where forest denizens can hide and take shelter. 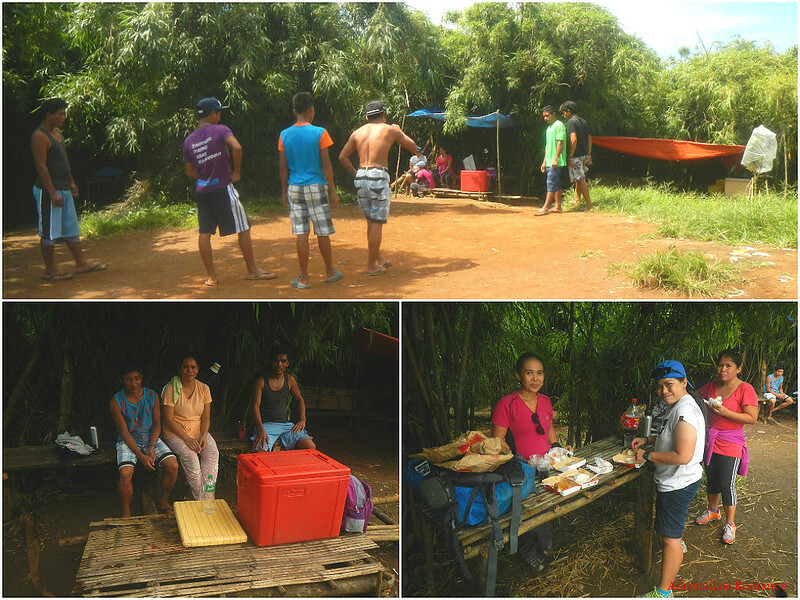 After an hour or so, we came up to this nice rest station that locals built. It was really tempting just to stay there for awhile, close our eyes, and just let the sweet songs of the mountain lull us to sleep. But of course, we had to go on. 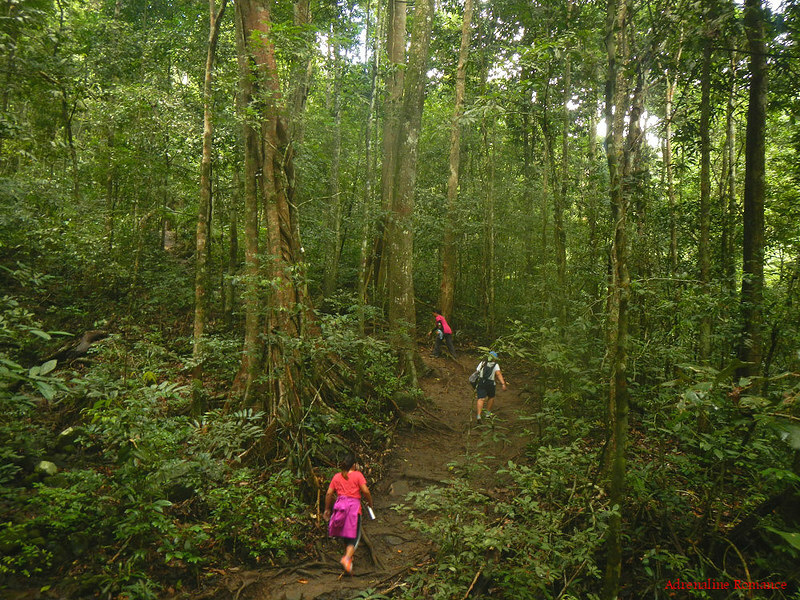 Soon, we left the thick, mossy ditherocarp forest and entered an area filled with tall and dwarf bamboo plants. This meant that we were at the mountain’s shoulder. We could see patches of beautiful landscape since there was lesser forest cover around us. Fifteen minutes past 12, a full two hours after we left the jump-off, we reached this thick tunnel of bamboo. At the exit of this “tunnel, ” we heard human voices, music coming from a radio, and a glimpse of makeshift roofs. 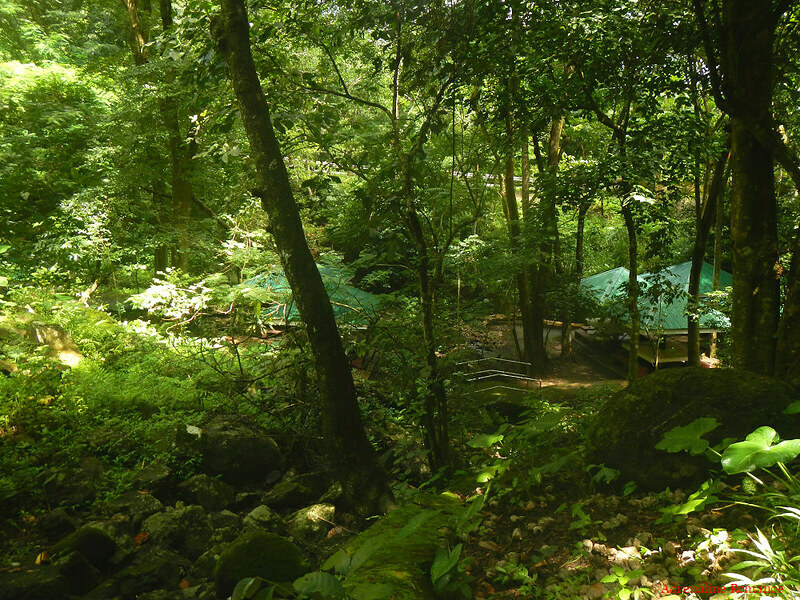 We arrived at Pico de Loro’s scenic campsite. Believe it or not, there are people here selling candies, snacks, soft drinks, liquor, and other merchandise in the middle of nowhere! There are even young guys who are playing a game of some sort. Since we brought packed lunches, we simply bought a bottle of cold soft drinks to wash down our meal. From the campsite, we could clearly see the sacred, pointed summit of Pico de Loro. Just check out that gorgeous vista. It is not every day that you can see amazing views like this. As you have noticed, the summit is just beside the campsite. After lunch—and with heavy bellies, we were ready to push up the last few hundred feet. But going up to the summit is quite a challenge. 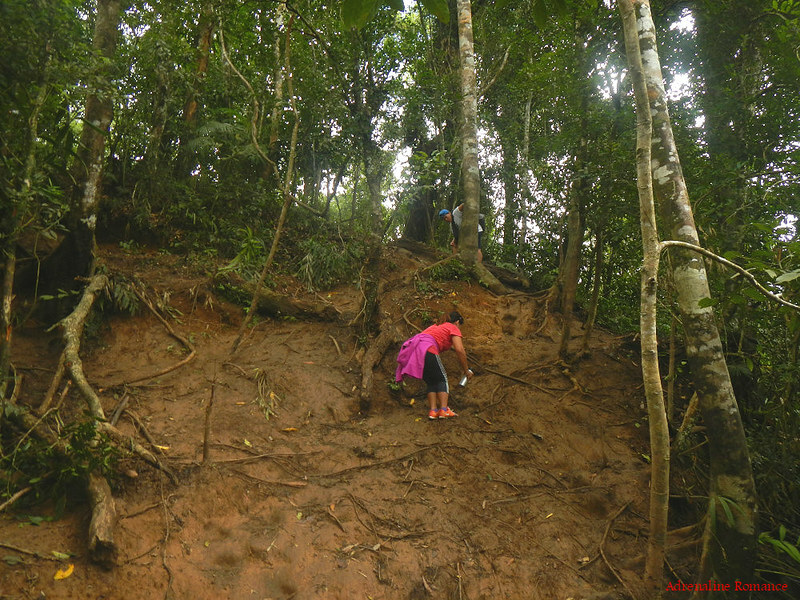 The trail is extremely steep; we reckon we have to climb a 60-degree trail marked with loose soil and rocks. We had to be careful as one slip would send us careening down the slope. Also, we had to climb some distance from one another as falling rocks and soil can hit the person climbing right behind us. Every small but firm foothold or handhold is taken advantage of. 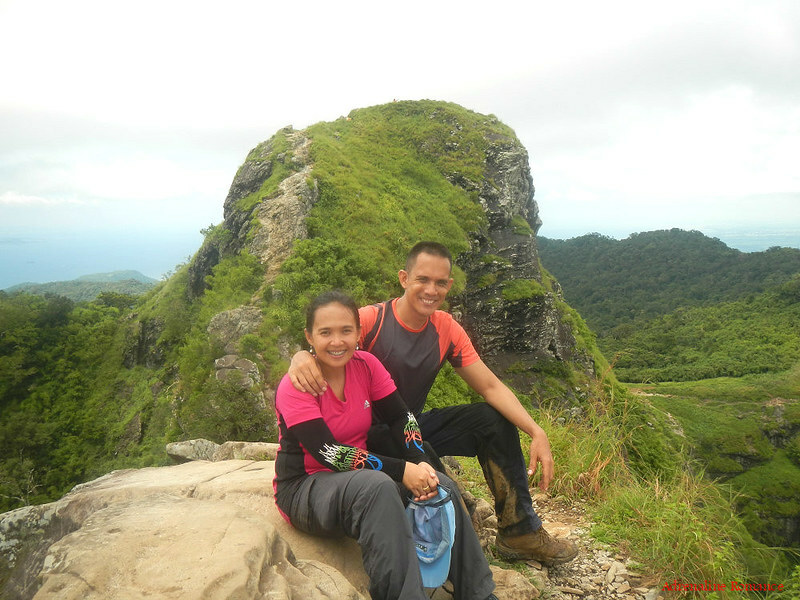 Finally, we reached the top of the Pico de Loro, 664 meters above sea level! Victory! We can see a wide expanse of the azure Manila Bay and, beyond that, the vast West Philippine Sea. From this high vantage, it is hard to believe that the bay is one of the most polluted bodies of water in the Philippines. Perhaps that inglorious reputation only applies to the area near the metropolis. The mountain’s verdant shoulder is very prominent here. That flat grassy area in the upper-left middle of the photo below is the campsite. It’s quite disconcerting to know that if you camp here, you are pitching your tent in close proximity to a vertical rock wall! Here’s another nice view of Manila Bay from Cavite. As you can see, there are mini-bays that surround the main bay. 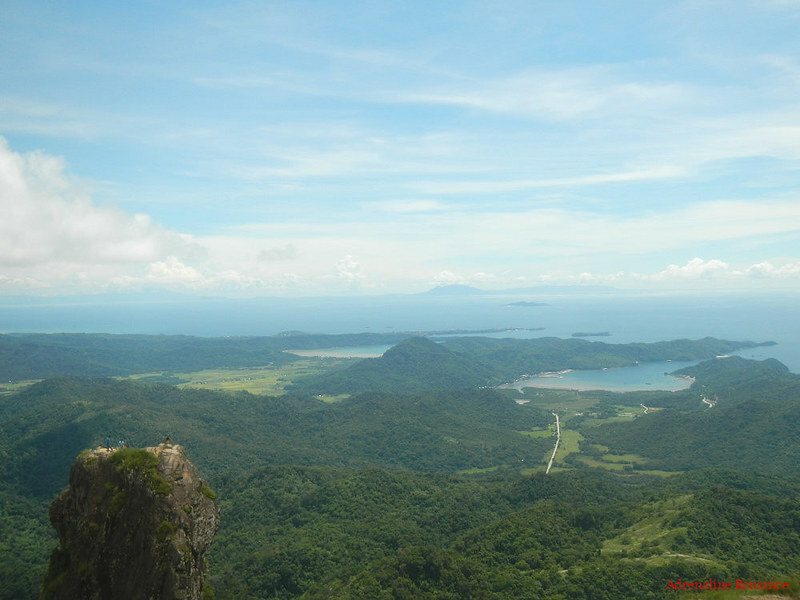 Also, we can see a large section of the Mounts Palay-Palay and Mataas na Gulod Protected Landscape from up here. Farmlands and roads are slowly encroaching the protected landscape. Wait, is that a huge, huge rock at the left bottom corner of the photo? Well, it turns out that it is! 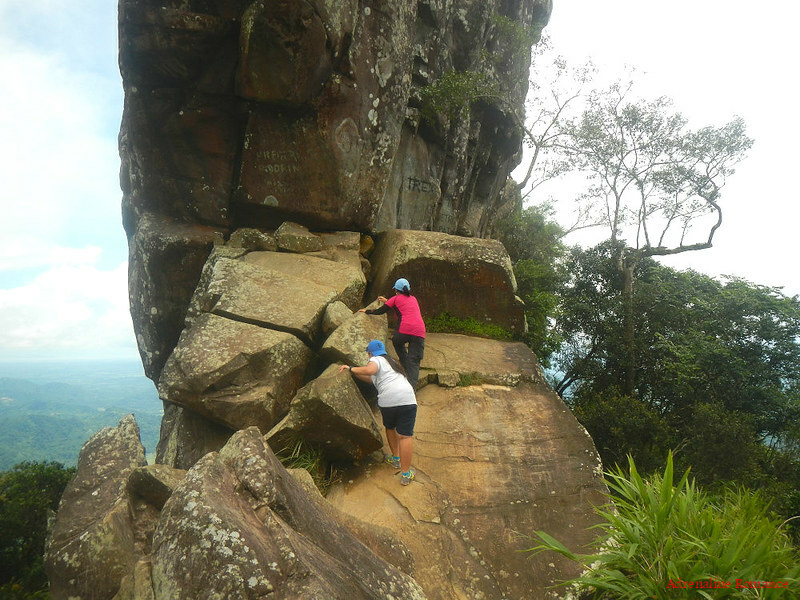 This is Parrot’s Beak, popularly called The Monolith, one of the major highlights of Mt. 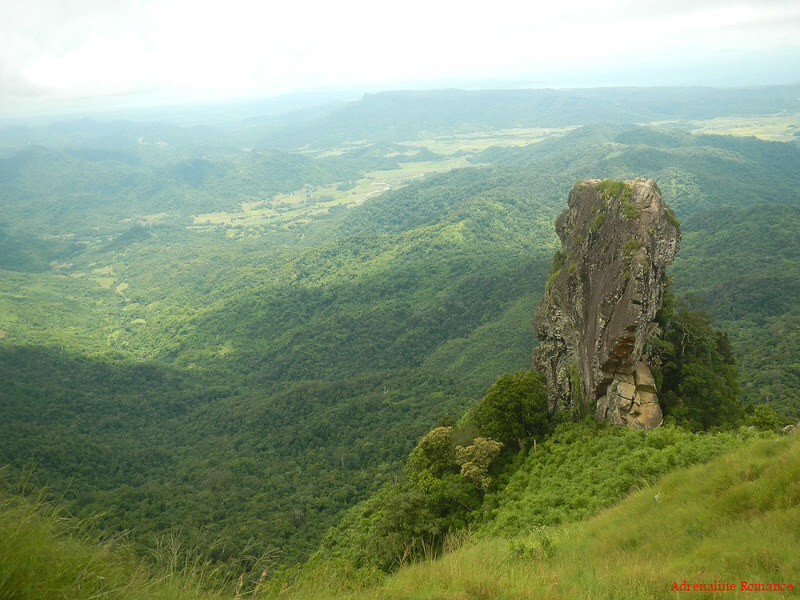 Pico de Loro. It is a single limestone monolith that juts out an impressive hundred or so feet just below the summit. 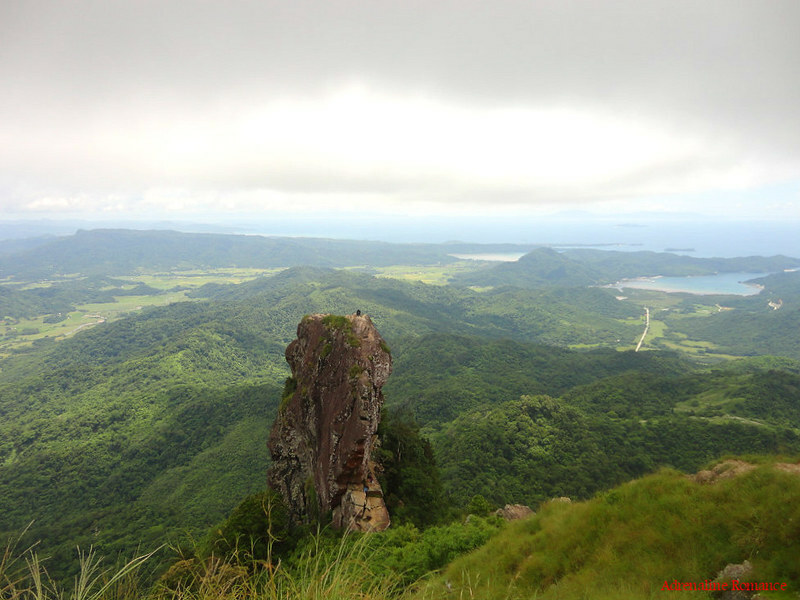 Pico de Loro is the Spanish term for Parrot’s Beak. It refers to the entire mountain and not just the monolith. Spanish seafarers gave the mountain its nickname because the sharp summit of looks like a parrot’s beak when viewed from Manila Bay. In the days of sail, the mountain was used as a landmark that signals sailors to turn east to enter Manila Bay. 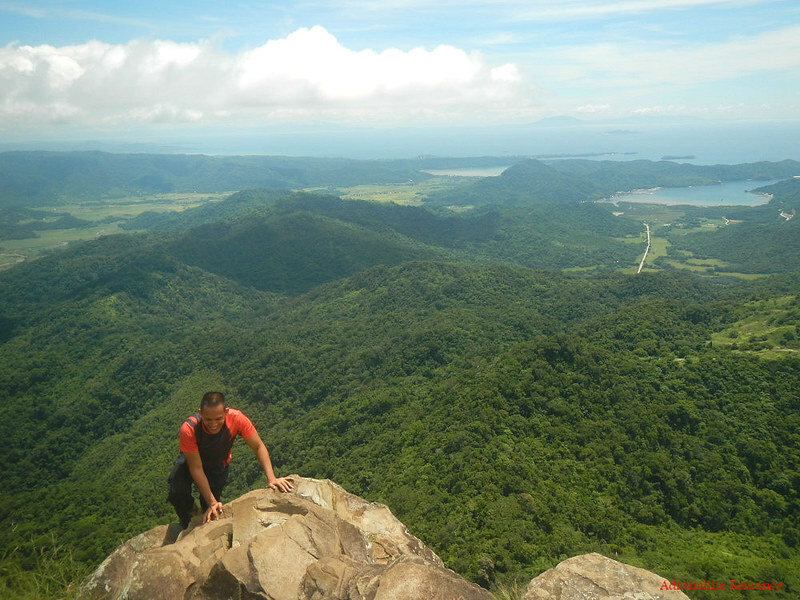 No Pico de Loro climb is complete without scaling the Parrot’s Beak. May decided to stay behind so she can take photos, leaving Sheila, Loraine, and me to scale the monolith. First, we need to climb down the summit. This is quite tricky as the downhill trail is steep and filled with loose rocks. And—the way is some sort of a knife edge. We arrived at the visible base of the monolith. 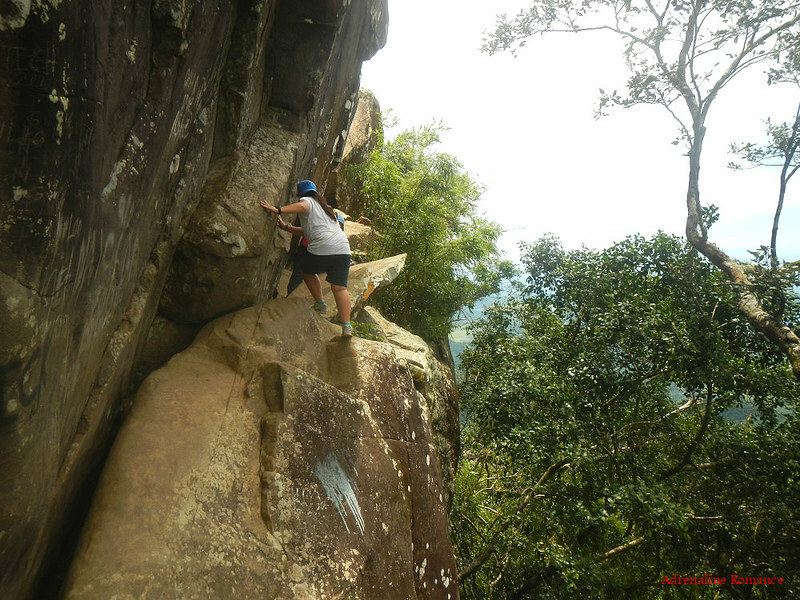 Climbing those smooth slabs is actually easy unless it is raining. The presence of ugly graffiti (yes, it’s sad) all around the rock means that Parrot Beak is frequently visited. Look at the photo below. It is obvious that you need to be extra careful here! We can’t emphasize that enough! Always check your grip and your footholds. Oh, note that at times, the monolith’s smooth walls are sometimes wet, especially after an evening or early-morning rainfall. To aid the ascent up Parrot’s Beak, locals have placed fixed lines. One can climb the monolith without using the rope, but it would be easier and safer if the lines are used. Once past the lines, it’s a relatively easy scramble up these huge slabs. We still had to be careful because the rocks are smooth, and there’s a long drop on one side. Almost there! 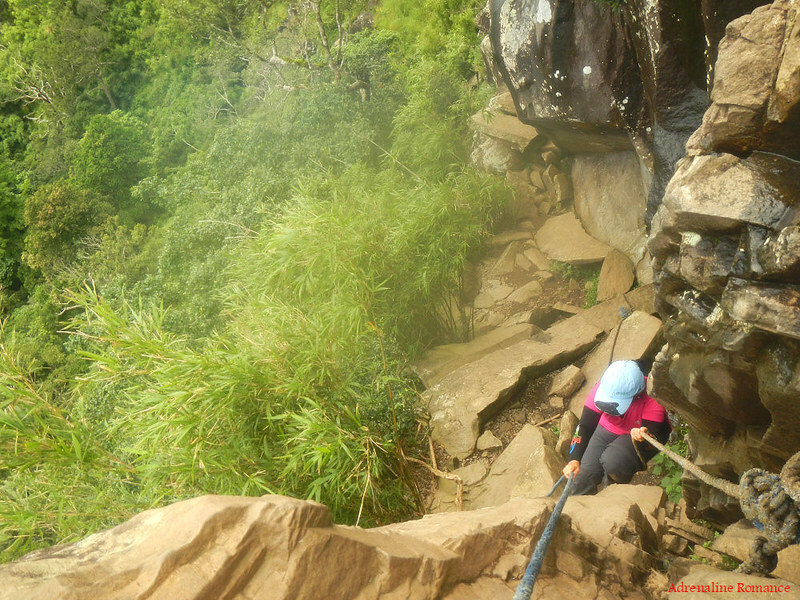 Yes, I was climbing at the edge of a long, long drop. This never failed to pump up our adrenaline. Check out the amazing landscape all around me. After a little while, we safely reached the tabletop peak of Parrot’s Beak. 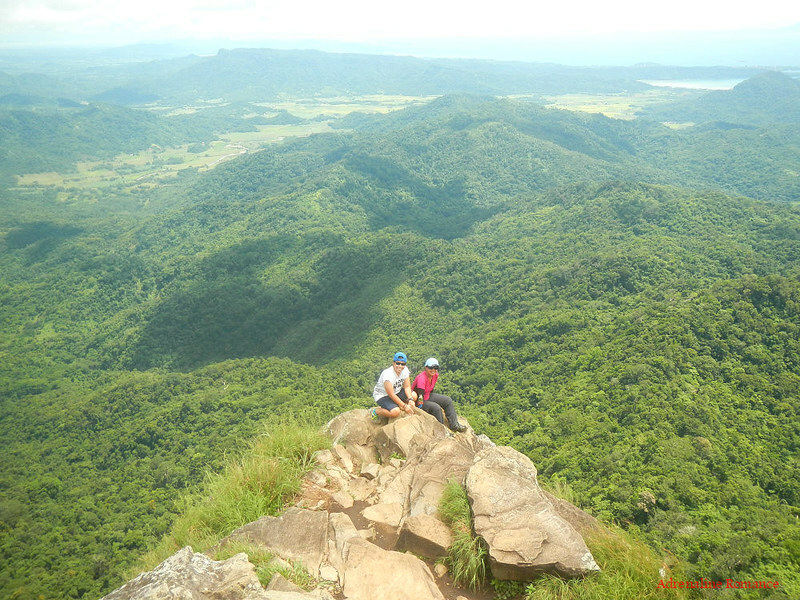 It’s like an optical illusion; from Pico de Loro’s summit, it looks it can barely handle a group of five people. But on the peak itself, it’s much larger than it looks. Will you dare? Thanks to May for this cool photo. Here’s a view of the summit from the Parrot’s Beak. Can you see May at the top? She’s the one wearing a pink top. From here, we saw the trail that connects the summit and Parrot’s Beak. Check out that rocky path at the left side of the summit. Can you imagine descending that extremely steep trail? Here’s a faraway fishing village in a small bay in Ternate. It’s very possible that those white strips are sandy beaches. After spending half an hour at the top of Parrot’s Beak, it was time to go back. After all, May may be broiling in the sun’s heat alone on the summit. Hehehe! Check out the right side of the trail. One slip, and, well, you know what happens. Sweetie and Loraine took one last look at this beautiful monolith. Most importantly though, look at the thick forest cover below them. Hopefully, with strict implementation of Protected Area laws, the encroachment will stop and won’t touch this forest. Here’s another view of the rope section as Sweetie carefully negotiated her way down. Also, notice the abundant amount of moisture on the rocks, which makes them slick, shiny, and wet. Be careful where you grip as wet, moss-covered slabs are very slippery. Yes, that’s a near-vertical trail up there. 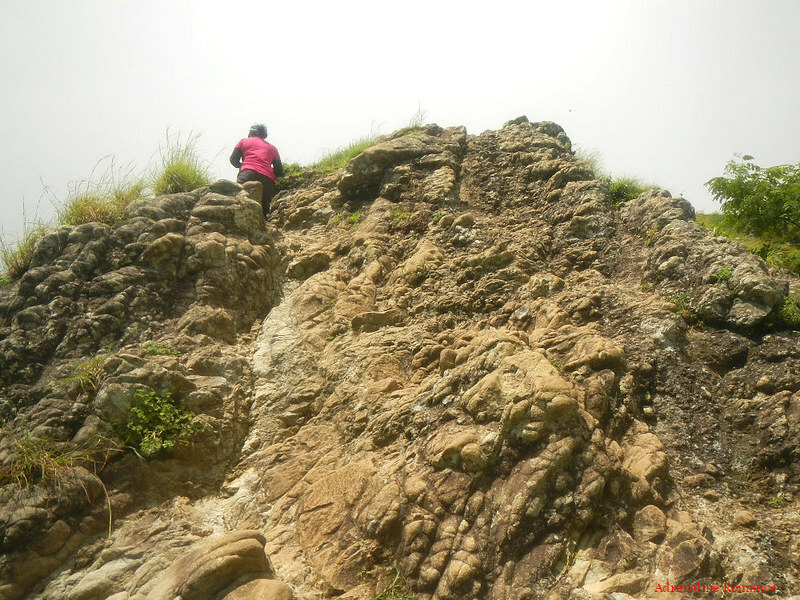 This is what makes climbing back up Pico de Loro’s summit quite exciting. I had to stay a little farther back for safety. Sweetie might dislodge a rock or two as she scrambles up, and those rocks might hit me. That would have been quite painful as I was not wearing any protective gear. 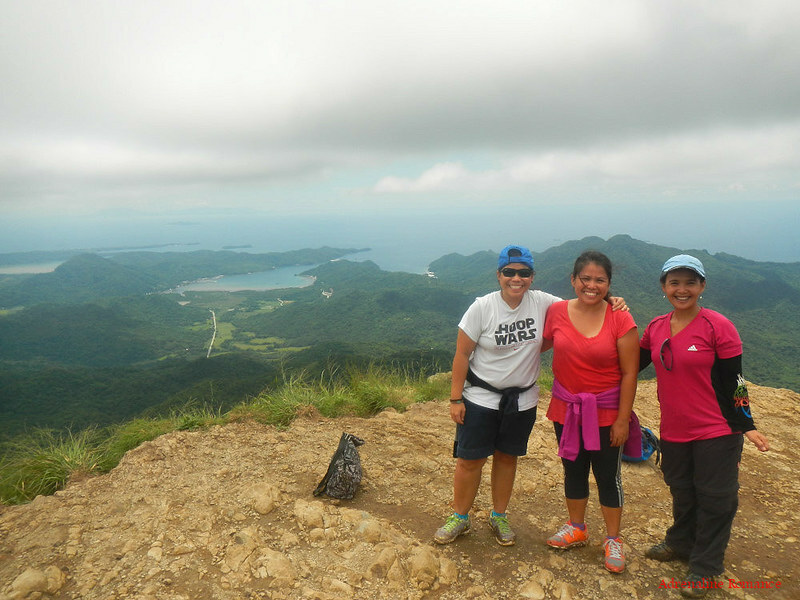 After reuniting with May at the summit, it was time to say goodbye to alluring Pico de Loro and head back home. Check out the steepness of the trail during the descent. Good thing that locals have hacked a series of footholds to make the descent a bit easier and safer. 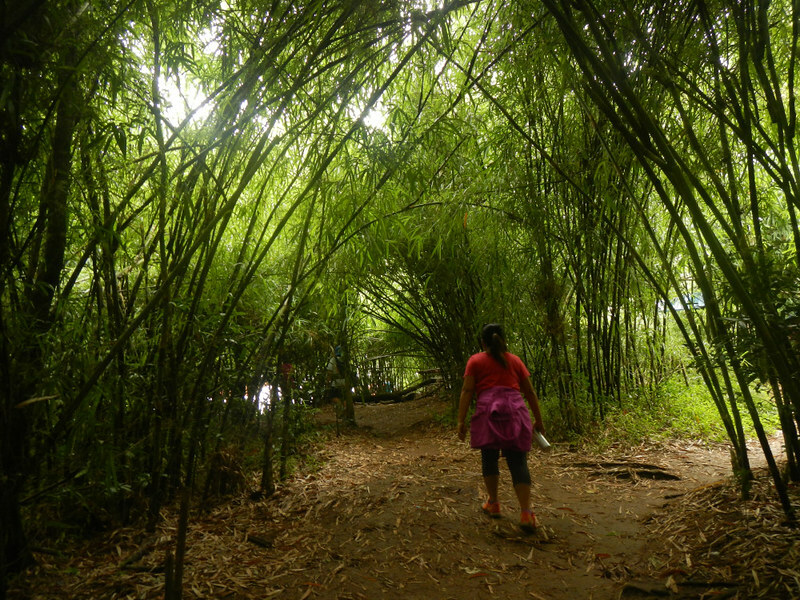 As we trekked through the jungle towards the DENR station, we noticed something following us. Is it a boar? A monkey? Some unknown creature? It turned out to be this cute, sweet, and shy dog who guided us all the way back to the station. She would get ahead of us, wait at a shady nook in the trail, then watch us to ensure we were on the right track. Yes, this cool canine never left us. We gave her lots of treats as a reward. The downhill trek was fast, but we did encounter a lot of slips. Hehe! Nevertheless, in less than two hours, we were back at the DENR station. We took a refreshing shower, changed into clean clothes, and rode a tricycle to the bus station to catch a ride back to Manila. Look at what awaited us when we arrived home in Cebu! 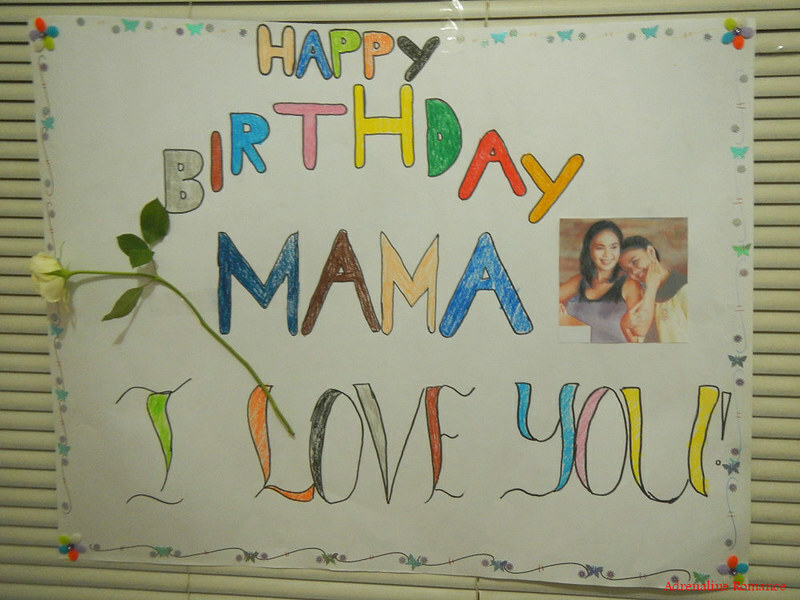 With all that love showering us, what a great way to end our Batangas-Cavite escapade. 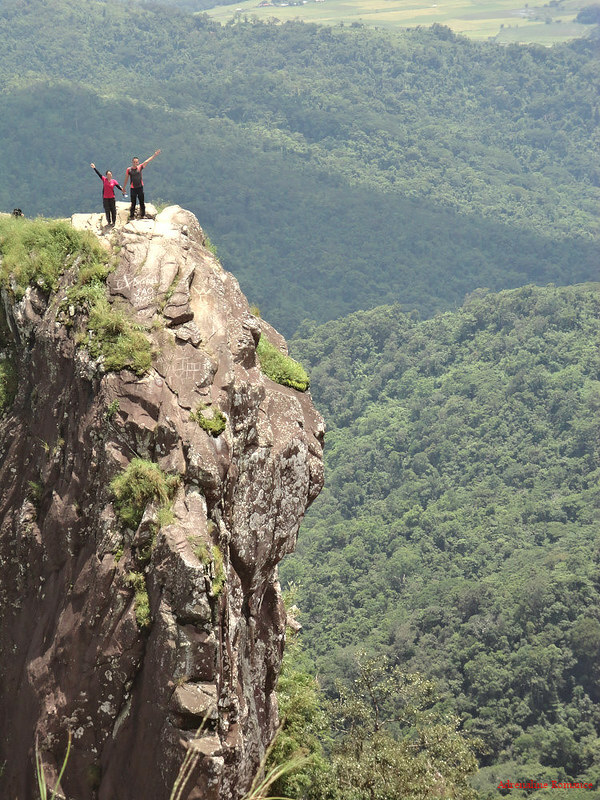 Pico de Loro is indeed a rare gem. 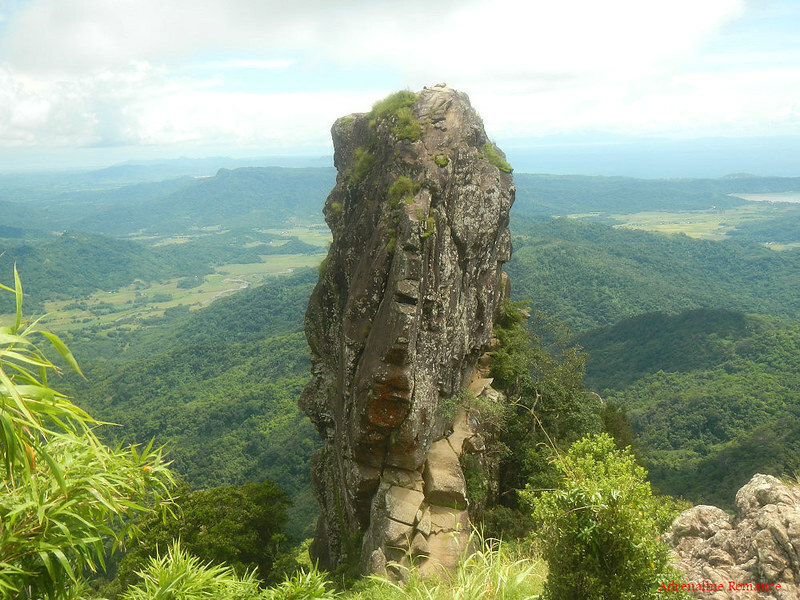 It’s an entrancing mountain that demands a lot of respect and protection. 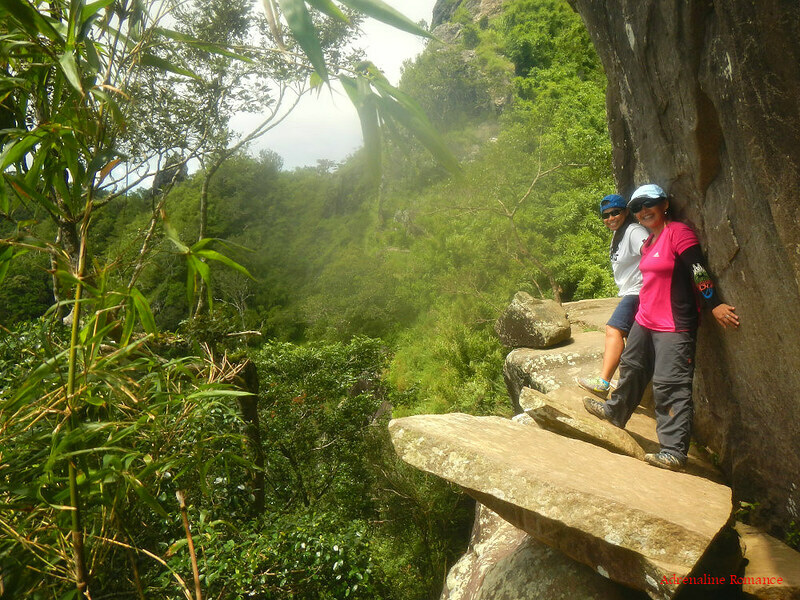 The ease of the hike, the shelter of the forest, the stunning scenery, and the scramble up Parrot’s Beak all blend together for an unforgettable adventure. Our Batangas and Cavite sojourn was a delightful success and a very fun trip. Yet, we have barely scratched the surface of these lovely provinces. Indeed, our country holds a gargantuan number of secrets and natural wonders waiting to be explored, discovered, and enjoyed. 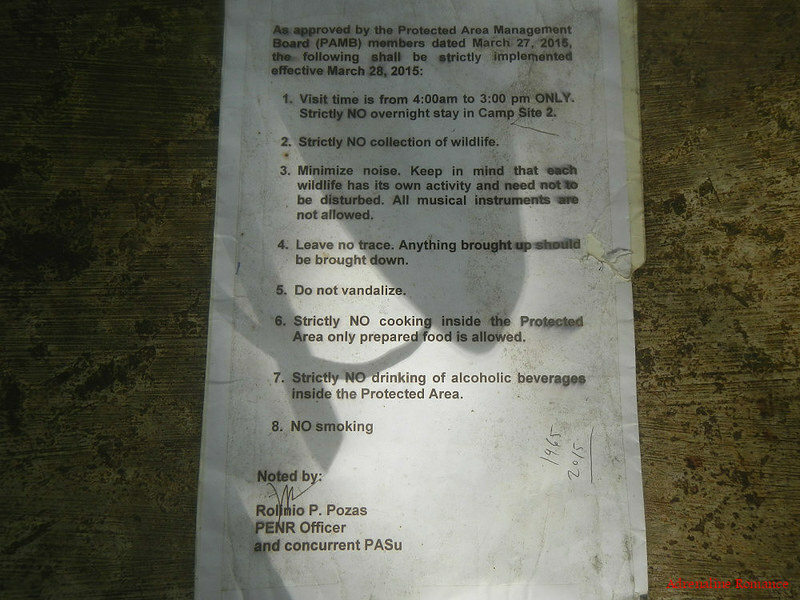 Climbing the monolith is now prohibited, according to DENR and Maragondon tourism officials today, citing safety concerns and ecological preservation. 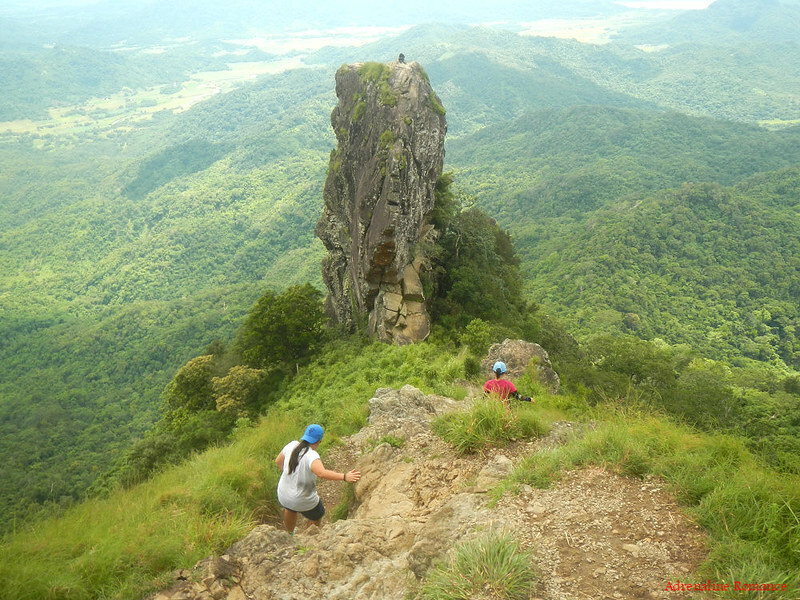 The Pico de Loro summit, however, remains open. 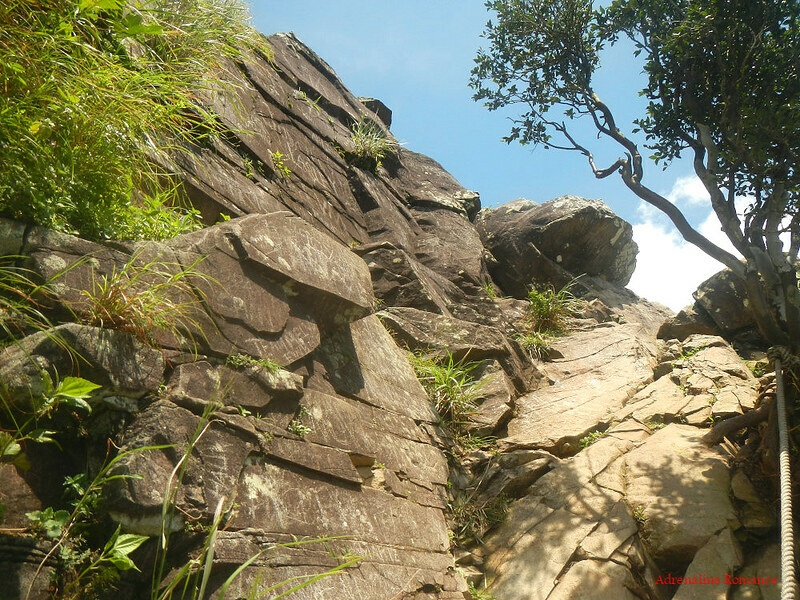 “We cut off the ropes and put some barbed wire fences around the Monolith so that hikers will no longer go up,” a local DENR officer said in a text message to Gideon Lasco of Pinoy Mountaineer. 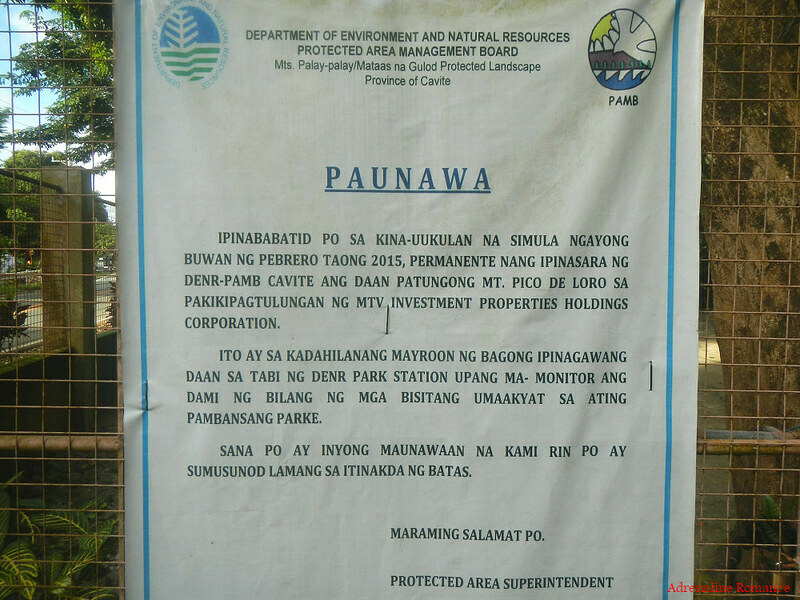 “Effective February 2015, the DENR-PAMB Cavite has officially closed the old trail that leads to Pico de Loro. This is in cooperation with the MTV Investment Properties Holdings Group. The closure is due to the establishment of this new trail that starts at the DENR Park Station. 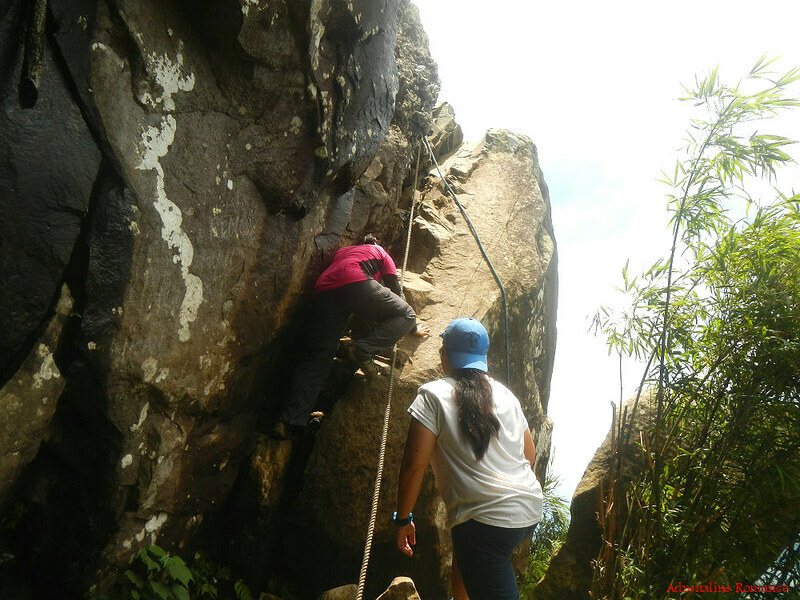 This will enable the agency to better monitor climbers who wish to visit the national park. 1. The itinerary and rate sheet above is more complex than usual because we started our trip from a far-off barangay in Mataas na Kahoy. There are more direct ways to get to Cavite from Manila. 2. 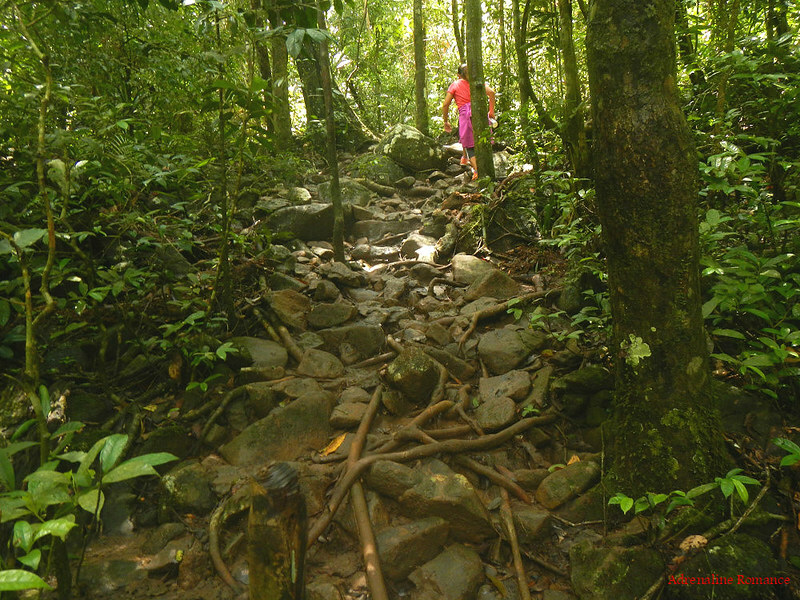 The trail to the summit of Pico de Loro is easy but relatively steep. Be careful of loose soil and mossy rocks as they tend to be slippery. 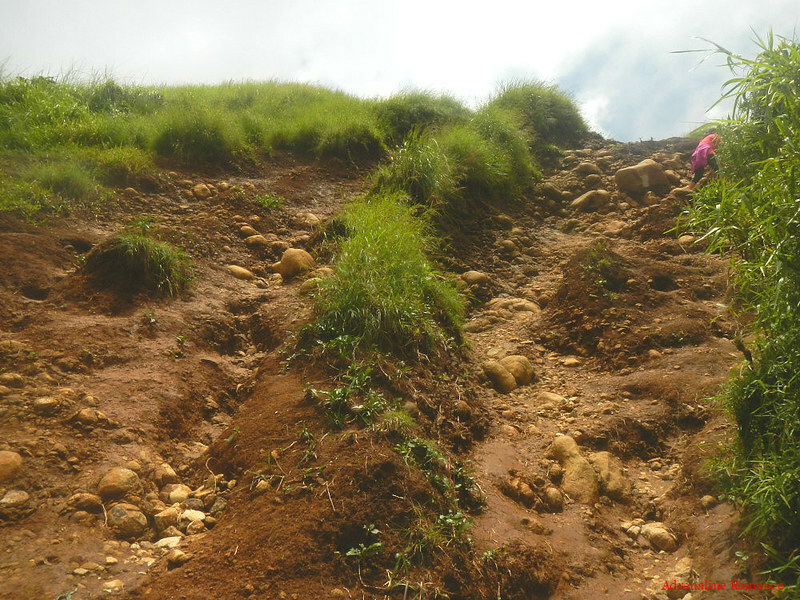 Take extra care when hiking during rainy season as the trail can be muddy. Wear trekking shoes or sandals with an aggressive tread. You will need a lot of traction since you will be scrambling over loose soil and slippery rocks. 3. The trail is well established, so you do not need a guide. 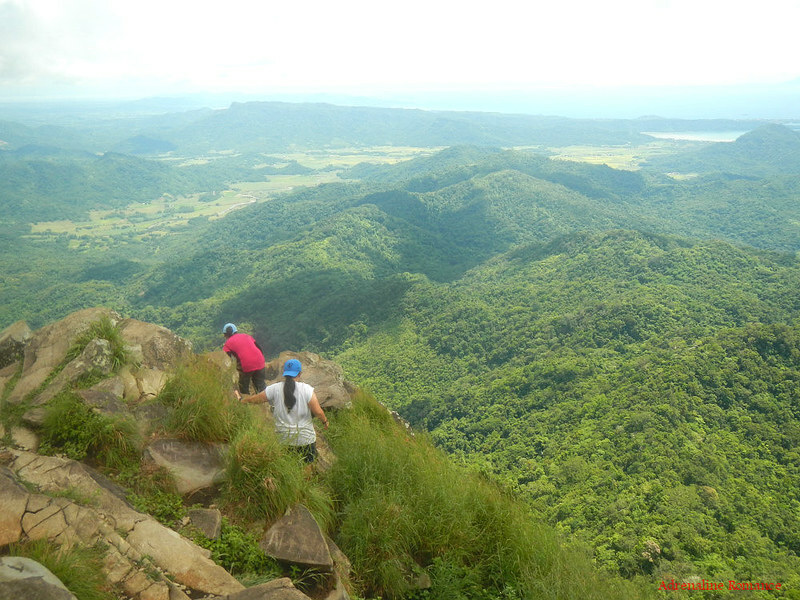 However, please do inform the DENR personnel on standby if you wish to do a traverse to the other side of Pico de Loro. 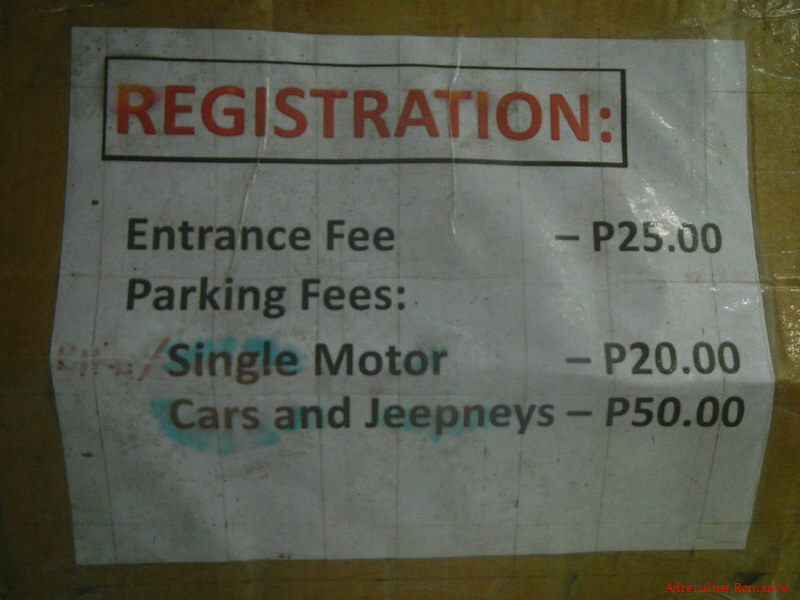 As a default, those who are registered at the DENR station are assumed to backtrack back to the station. 4. Be very careful when climbing the Parrot’s Beak as the area is surrounded by deep ravines at all sides. Use the fixed ropes, and watch your step. 5. Like Mt. 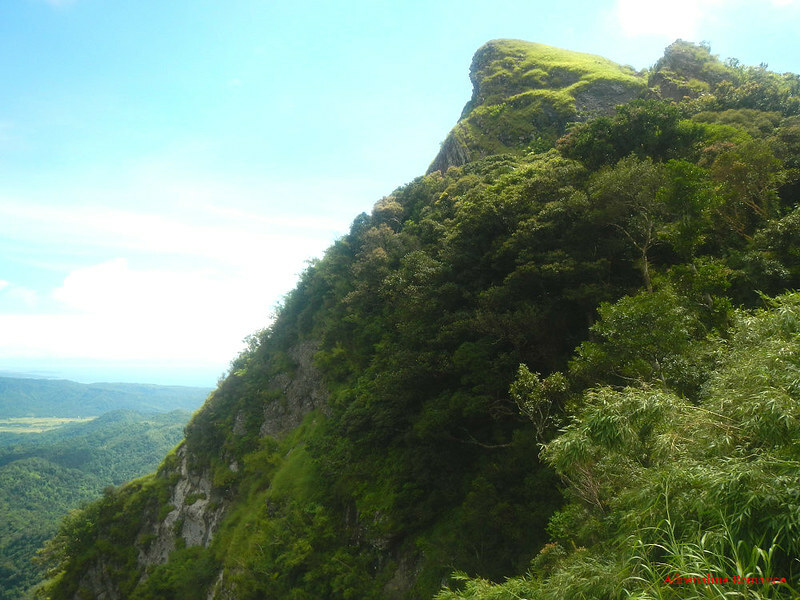 Maculot, Pico de Loro is a very popular mountain. As a result, there is a certain degree of commercialization. Help reduce environmental impact by keeping your group compact. Bring down your trash; it does not belong to the mountain. 6. 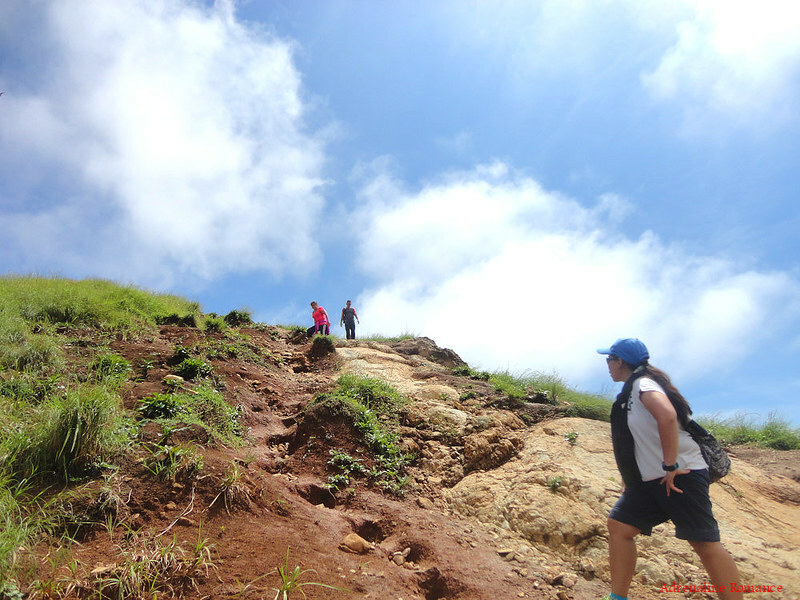 To avoid large numbers of hikers, climb the mountain on weekdays or early in the morning. 7. We do not recommend buying refreshments at the mountain store at the campsite. Aside from being overly expensive, purchasing from them would increase commercial activities on the mountain. This will have negative effects in the long run as commercialization destroys the environment, increases trash, decreases self dependence, and invites less-than-desirable individuals. 8. Wear arm guards and trekking pants to protect your skin from the sun and prickly plants. Also, a dry-fit shirt or rash guard will help keep you cool. 9. Bring salt tablets or ion-filled beverages such as Gatorade, coconut water, or fruit juice aside from water. 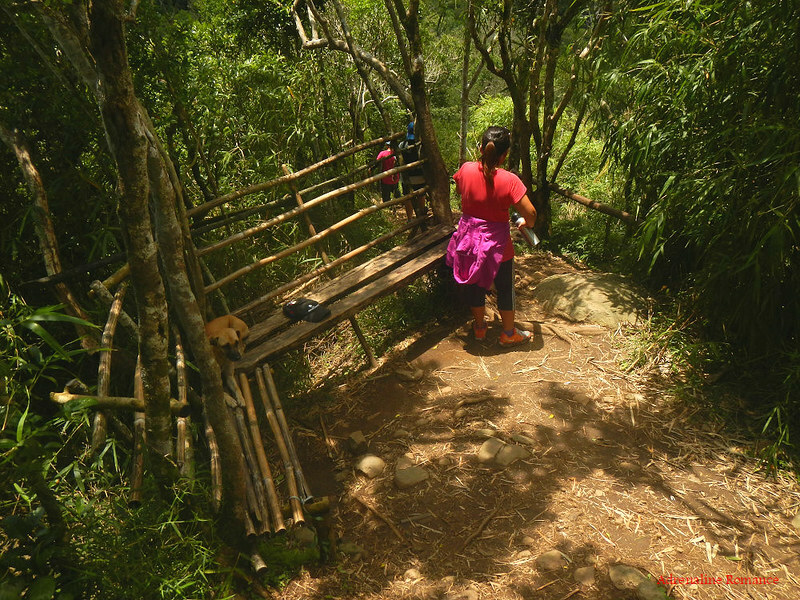 The hot sun, multiple ascents, and exposed trails can make you sweat a lot. When you lose enough ions and salts via your sweat, cramps will occur. If cramps happen, rest for awhile, drink a lot of water or ionic drinks. This will replenish the ions in your system. Bring energy-rich trail food such as nuts, crackers, bread, and bananas. Don’t underestimate the mountain. 11. Don’t forget to waterproof your belongings. 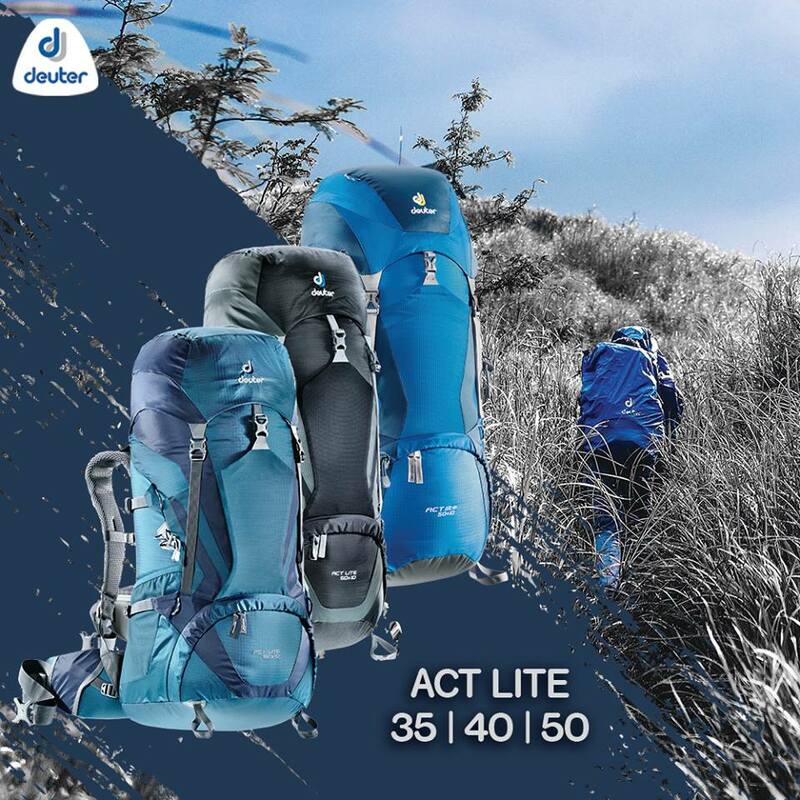 You can do this easily by wrapping your stuff with plastic bags or zip-lock bags before putting them inside your pack. Great job Gian and Sheila! Hehe! Kaya mo yan! It’s actually easier than it looks. 🙂 You’ll just have to be careful, though. Shet na malagket,sorry napa shet tuloy ako, uber ang ganda, in my bucketlist!!!!! awesome so awesome great job guys,xoxo BING. Hehehe! Thank you very much for the compliment. No, we didn’t hire a guide since it isn’t required. You just need to follow the established trail and be extra careful when going up the Parrot’s beak.